Wedding Hacks - 5 Things Every Bride can DIY at her Indian Wedding! The Indian wedding planning process brings with it a lot of research, coordination and mini-fights with the décor-wala. Sometimes, you want something, but your event planner seems to be going a different route. Thus, the best ways to keep your calm and get what you want is to Do It Yourself, Yes! As loyal followers of all things Pinteresting we bring to you ways you can DIY your Indian wedding. We give you tips, tricks and more! From mehndi ceremony decoration ideas to DIY-able Indian wedding favors too. Allow us to show you the ropes on the sweetest ways you can DIY your Indian wedding. We wouldn’t say wedding table centrepieces are easy-peasy- lemon-squeezey but we found some simple ideas that will make your centrepieces standout! Try artificial flowers set in shimmery glass jars or lace-wrapped candles – it really is as simple as that. 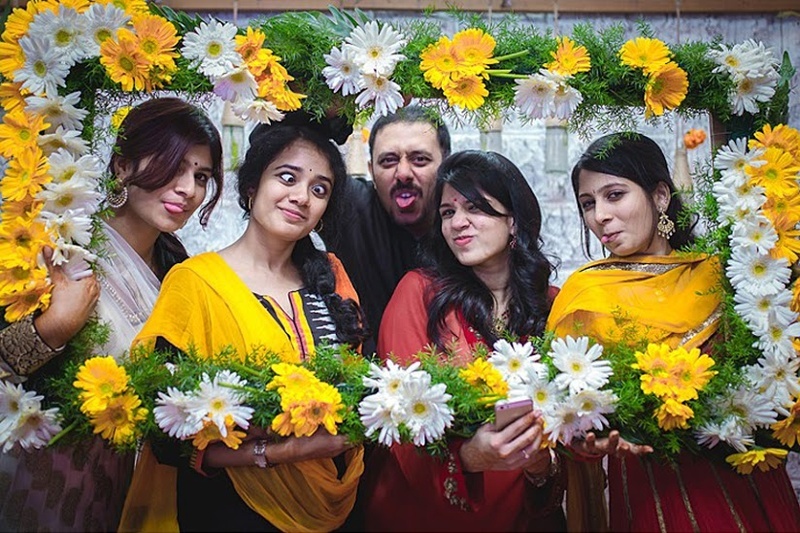 Real bride Maitreyi DIY’d her mehndi ceremony to perfection – floral topiaries, globe lights and photos hanging on the wall for that sweet personalized touch. While Real bride Veda too had an intimate DIY mehndi ceremony filled with vibrant drapes, pinwheels and Arabian lamps – too stunning for words! Use all of your artistically gifted friends’ talent to create a beautifully calligraphedwelcome frame or cute signages to hang all around your wedding venue. Incorporate your wedding hashtag, favourite Bollywood movie quote or even a quirky caricature – DIY to personalize is always a good way to go! This is your chance to go all-out DIY on your wedding. We recently came across these uber cute emoji photobooth props – never done before at a wedding and oh-so-easy to execute. You can also print out quotes from your favourite movie, a particular inside joke in one word or sassy song lyrics to up the cute quotient on you wedding photobooth props. Set up jars with yummiliciou s’more ingredients or even peppermints if you want to keep your relationship minty fresh! Food items are your best bet as a giveaway. And when it’s something that satisfies the sweet tooth? Even better. Buy jars in wholesale and fill in your favourite kind of mithaai or chocolate. 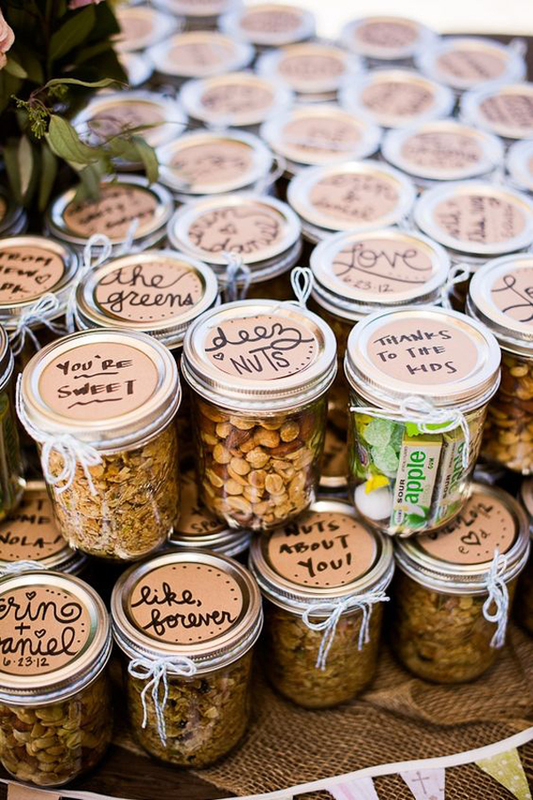 Add a touch of personalization with quirky messages on the jar or cute thank-you notes attached to the wedding favour.